Want to make a bold and stunning statement at your wedding event? Time to give your décor an extra touch of fervor and classiness. Make your seating arrangement stand out and sparkling, dressing your chairs in stylish chair covers finished with astounding satin chair sashes. When you want to create a special VIP area for attendees like groom and bride family, bridesmaids, or just want to differentiate every other seating place, adding satin chair sashes will provide you with a distinguished and elegant finish. Not only just, even when you want to turn you just good looking table décor into something eye-catchy, adding flair to your chairs with sashes will create the right effect. Whatever the need is, the expansive rage of satin chair sashes at BB Crafts will fulfil your requirements comprehensively. We have an assortment of choices for you to give your seating arrangement ritz and posh, upping the level and class of décor at your event. Complete your party’s design, embellish those chairs picking from wide color of options, right from red, daffodil, blush, aqua, coral, apple, silver, white, black and much more. Available in 6x106 inch size, each pack contains 10 pieces. 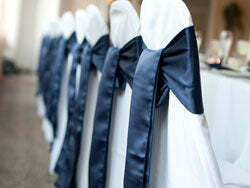 Colorful, versatile and exquisite range of satin chair sashes. Buy online at low prices!